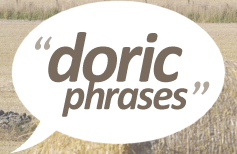 The Doric dialect is the vernacular spoken widely by those native to the North East of Scotland. We have a guide to these unique words and phrases on the language page and these can be found in our A-Z Words or why not use our Scottish Translator Tool which will automatically translate English into the Doric dialect. Good fellow I trust that the impact of my person did not incommode your labour. Na, na. If ye're nae in yer ain wye, ye're nae in mine!